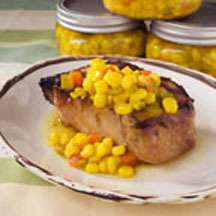 CooksRecipes has quality, kitchen-tested recipes for diabetic-friendly canned peaches, corn relish and pickles that you can count on for accuracy and deliciousness. 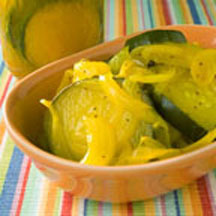 These crisp, sweet pickles are a welcome accompaniment to sandwiches and salads. Bright yellow corn and two kinds of peppers create a colorful relish to savor on hot dogs, burgers, meat, poultry or fish.